This follow up to the movie Dredd opens early in the morning in the northern sectors of Mega-City One. 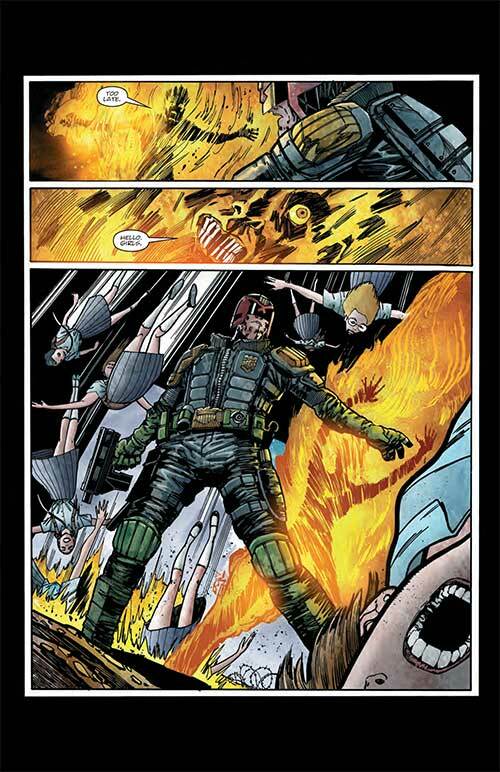 Here Dredd is tracking down an arsonist named Matches McGee. 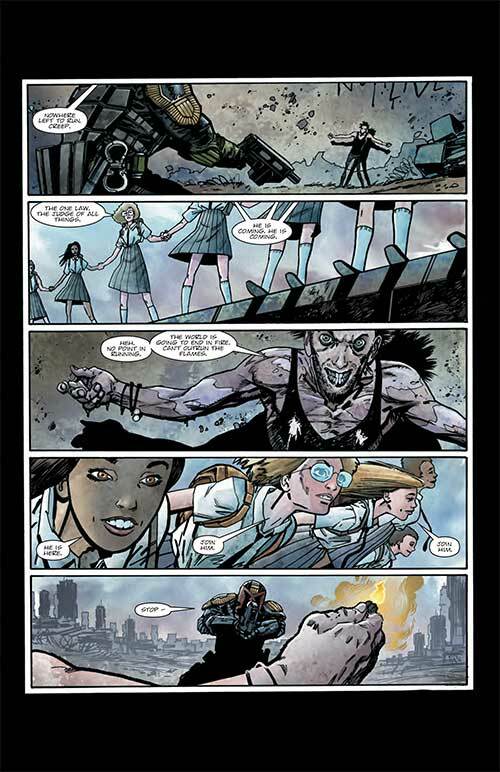 As he gets the perp up against a wall, a group of eight schoolgirls, all the same age, hold hands and jump to their deaths from the wall above just as McGee torches himself. Dredd can’t figure out why they did it even after he investigates the scene. 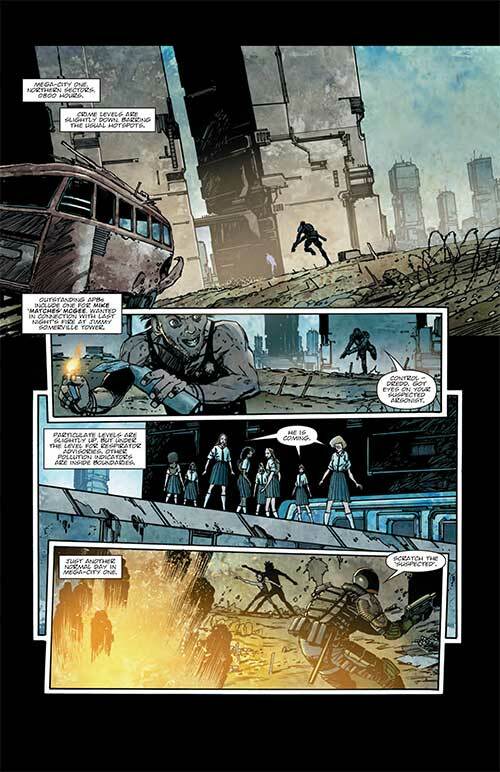 Before Dredd can wrap it up, Control radios him – he’s needed at a priority case over at Tek 21. A junior Judge named Conte will pick up where Dredd left off. He’s not really happy about it but he knows that maybe a rookie not quite so jaded as he might bring a different perspective to the events and be able to figure out the connection. At Tek 21, Judge Dredd is briefed on Project Proteus, a scientific endeavor that will hopefully help with Mega-City One’s ever increasing resource problem. After the briefing one of the scientists, or ‘tek’, drops dead, presumably from a heart attack. Dredd is rightly suspicious and it turns out that a few of the other teks that were on the scene are also dead – and then, undead. Dredd doesn’t realize this but we see one of the jumpers get out of the body bag she was wrapped up in and shamble across a crime scene. Reports start coming in that crime levels have been rising throughout the day – murder and suicide seem to be unusually popular. And some of the seven teks that were brought in to work at Tek 21 are missing. Dredd wants to talk to someone who might have answers and is referred to Penny Maxwell, a woman who would normally be part of the team but who has been off sick a lot lately. He heads over to her apartment at the Gary Lineker Towers. When she answers the door, her face looks half rotten but she knows something went wrong with experiment since he’s shown up at her door. She tells Dredd about the side effects and how during their work they found an entrance to another dimension and how’s reached ‘perfect entropy’ and is effectively ‘dead’ (her words). Dredd tells her that the three missing teks are likely on the other side of that portal, and she cautions him not to open it again. When Dredd leaves and notices a foul odor coming from the apartment next to Maxwell’s he calls in for a warrant, gets one and then busts in only to find that there’s something very wrong with its inhabitant, Eddie Vader… and then all Hell breaks loose. A solid script from Wyatt and De Campi makes this an interesting read. 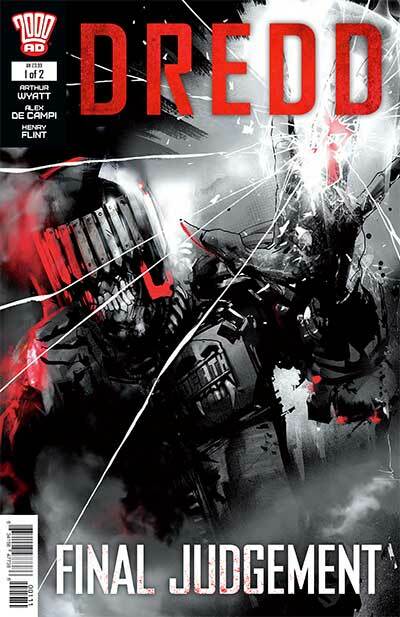 We already know from the cover art that Judge Death is going to play a big part in this story and by the end of this first issue, it’s clear that Dredd’s most notorious foe is set for a return to the Mega-City One of the living. It all ties into the Tek 21 research work, it’s explained quite well in the dialogue that occurs throughout the comic, and yet it leaves open room for plenty of thought, given that science can only do so much to explain the supernatural. Dredd is written well here, they do it by the book in that respect, not really changing his character all – if it ain’t broke, don’t fix it, right? But the supporting cast here is interesting, Maxwell in particular. She undergoes some unusual changes in the last half of the issue that are sure to lead to big things in the next chapter, and there’s clearly a lot more to Mr. Vader than we realize yet. This gives the writing team lots of interesting ‘stuff’ to throw at everyone’s favorite law and order man, and throw it they do. The artwork from Henry Flint is super-detailed and very cool looking. Even they backgrounds show a lot, there’s s gritty feel to the work that goes a long way towards pulling us into the storyline. 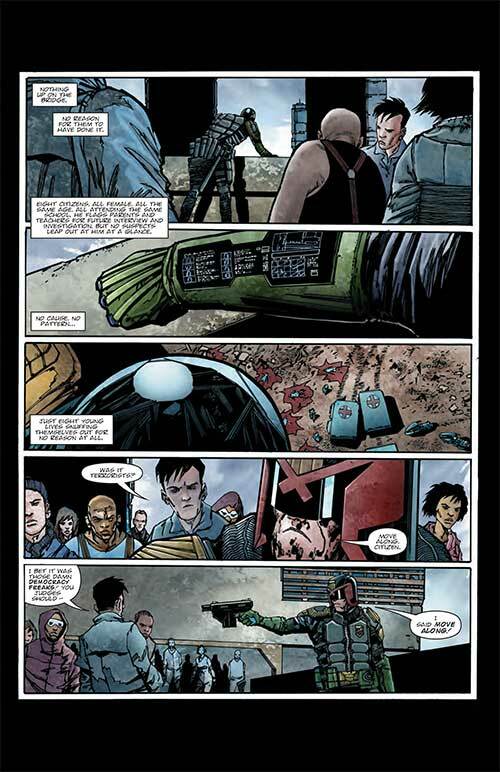 The coloring work from Chris Blythe is also very good, bringing brighter hues to the forefront when there’s a need for it but keeping things very much in the dark and grubby look that the Dredd movie brought to the big screen (this is a follow up to that, remember). Dredd is drawn well, wearing the slightly different outfit that he had in the movie and bearing a slight resemblance to Karl Urban, but still with that trademark scowl and weather-worn jaw line that is so automatically associated with the character. Panel layouts are great, very cinematic in spots, and there’s a good sense of movement and flow to the art. Full marks for this one, it’s a lot of creepy fun with equally good doses of action and suspense thrown in. Great art, a great story –what’s not to like? Looking forward to the second issue.